Ghost Ants - New Era Pest Control Inc.
Ok, so you have ghost ants. You’re not alone! Ghost ants are the #1 complaint we receive. These tiny, tiny spider looking ants trailing around your kitchen and bathrooms. Across the countertops, around the sinks, where they go, nobody knows. It seems like they are everywhere! So you grab the can of pest control spray and blast them in hopes of them dieing, never to return. That works for a short while, only for them to return, seemingly healthier, and more plentiful. Those trails of ants are driving you nuts! You keep the counters clean. You take out the trash regularly. Your at your wits end! What do you do? They understand ghost ant mating and nesting habits. Let’s face it! You have done a good job trying to get rid of the problem, however hiring someone with all this knowledge sure will save you a bunch of trial and error and many days with even more ants than what you started with. Now that your friendly pest control professional has come to the rescue, he’s going to come in and wave his magic wand and the problem will magically disappear, right? Wrong! Most customers don’t truly understand what it takes to get rid of a ghost ant problem, they just want them gone, and we get that. We truly do! We also don’t want to preach about ants, but we do like to educate our customers, so they know what to expect. Remember, you did not acquire these ants overnight, and even though your technician is a master at getting rid of ghost ant infestations, he is not armed with that magical touch we all wish they possessed. Ghost Ants require time and patience. Typically 3 to 5 weeks. This time frame is not always the case, depending on the level of customer participation, and involvement. With customers assistant this time frame could be significantly less. Its easy to grab a can of Raid and blast these ants into kingdom come. Please remember if you choose to do so, you may be creating your own nightmare! Killing those trailing ants is only going to make the problem worse! Here’s Why! 1 colony splits into 2. And 2 into 4, and 4 into 8, etc. etc. And now you will see more ants than ever. The proper way to treat these types of ants is a professional baiting program. 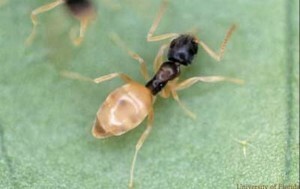 The concept is to supply a series of baits that will attract the ants. The ants will carry the baits back to the colony and feed the queen(s) and the brood (colony) and die. Killing the entire colony is the ultimate goal and this concept brings forth a much more effective result! Yes, you can buy products from home depot that are boric acid rich. These baits (Terro) contain boric acid. The true downside to this product is, by the time the ghost ant worker consumes the liquid sugar based bait, and carries it back to the nest, the workers die from the boric acid. Creating the same dilemma. Dead workers and stress on the colony. One more thing to consider. Ghost ants can be finicky eaters. Ghost Ants prefer sweets and is the reason they are found surrounding sugar based goodies. Cookies, candy, sugar, etc. However, they are also known to be attracted to protein based foods. Meats, carbs, grease, etc. There are many times when professional technicians will offer sugar based baits, yet the workers will pass right by this type of bait, in search of the proteins they crave. The trick is to know when to offer sugar based baits or protein based baits. Knowing which to offer greatly increases your chance of success. Many times, this ant species lives outside and will easily sneak inside for search of water and food. In turn these ants will set up camp in a wall void, making it virtually impossible to find. Locating the nest is key indoors, but can take some time to find. 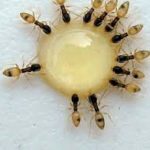 Were sure you don’t want us to start ripping your walls apart in a desperate search to locate a nest of ants, so a more methodical method of baiting or dusting is usually preferred. These methods also require time to perform. Time and patience are required when dealing with Ghost Ants! Check all flowerpots for ghost ant nests. This is very common! Bringing in flower pots from outside is a main reason for ghost ant infestations. Check under flowerpots on the exterior as well. Trim all trees from the structure. Any tree or shrub touching the structure, will create a bridge for them to cross over into the house. They then find small hole/crack and enter the home. Be sure to remove any clutter surrounding the home. Rocks, construction material, mulch, bricks, bags of mortar, fire wood, etc. Removing these will help dramatically! Leave all countertops and floors, free from food particles. Even the smallest morsel will provide an abundance of food for ants. Wipe counters then sweep the floors in that order on a regular basis. If you leave something out with sugar, they will find it. Keep all sugar based items in sealed containers and wipe the outside of container to remove any sugary residue. Clean and wipe out all shelves in cabinets, or pantry with household cleaner so that they are not attracting ghost ants. Clean the sides of your stove! Nobody ever thinks of this, but when in protein feeding phase, the grease accumulated on the side of the oven offers some great protein treats for these ants. In the bathroom, during treatment phase, place toothpaste and toothbrushes in sealed plastic bags. Ghost ants love bathroom sinks. They get sugar from toothpaste and water from the sink. Ghost ants on your tables, desks, nightstands? Clean up all water, even water rings from a glass and food morsels, and you will not attract them. Remember even the smallest drop of water or food looks like a mountain to them. Imagine a steak the size of Mount Rushmore. You could feed a lot of people with that! We encourage the feeding of ants with our bait products. Please do not clean them up. Wiping counters is ok. But refrain from any major cleaning of the backsplash area, window sills, under the lip of the counter. Etc., as our baits are close by. Wiping them up only ruins an opportunity for the ants to find them. Together, we can get rid of your ghost ant issue, but please remember, this process of baiting takes more time to deliver the active ingredients to the queen and brood. 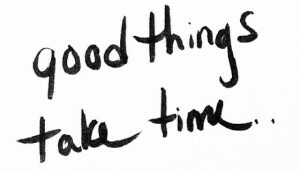 Due diligence will shine through as a reward for your patience. The ultimate goal is an ant free home. Thanks for reading this information and use it to your benefit! Have a pest free day! Natural Pest Control – Safe For Kids And Pets! Natural Pest Control in Miami. Safe for Kids & Pets, No Harmful, Smelly Chemicals! 100% Guaranteed. Fill out the contact form with your contact details and a short description of the problem you’re having. During office hours one of our representative will get back to you with a free quote and once the appointment has been scheduled, our certified experts are dispatched immediately!